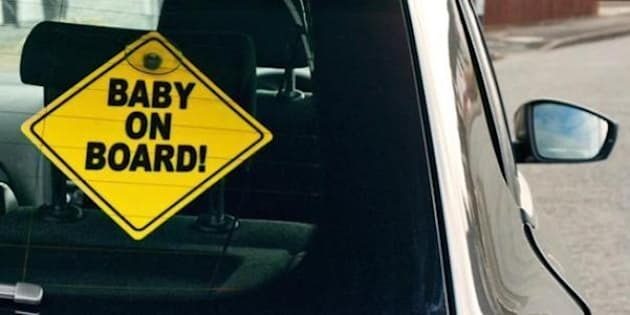 While some parents swear by 'Baby on Board' signs, there’s a a stigma around them. Some people say they're "obnoxious" or even dangerous. So we decided to investigate how the ubiquitous signs came to be. The yellow, diamond-shaped sign first arrived on the market in 1984. Michael Lerner, a successful recruiter at the time, was apparently approached by a friend who wanted advice on how to market the signs. Lerner wasn't a parent, but he was reportedly sold on the idea from his experience driving around with his 18-month-old nephew. The idea is that people will drive more safely around a vehicle they know has a baby in the backseat -- and what parent doesn't want to keep their baby safe? So Lerner invested his own money in the product and started up the company Safety 1st, which is now owned by the Canadian company Dorel Industries. The signs, which are usually placed in the back window of a car, were an instant hit. USA Today reported that 10 million have been sold in the past 30 years. Some emergency workers have found the caution signs to be useful for other reasons. In case of an accident, for example, this noticeable sign can alert emergency personnel that there is a child in the vehicle who might not be able to get themselves out, says Julie Townsend, the deputy chief executive of the UK road safety charity Brake. She warns that parents should only use the sign when the child is actually in the vehicle. Similarly, yellow signs for children with autism or special needs have been created to help alert emergency personnel of kids who may not respond to them in case of an accident.